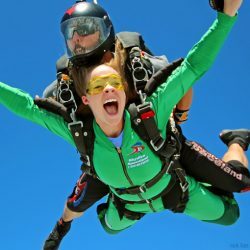 Your First Jump: Tandem Skydiving! Note: You must be at least 18 years of age and weigh less than 280 pounds to tandem skydive. For more information about who can skydive, what to wear, and more, please see our Frequently Asked Questions page. What’s the first jump like? Check this video out to see the Skydive Spaceland experience from start to finish! Skydive tandem again and start learning how to skydive by yourself! You’ll work on turns, forward movement, and flying the parachute. BONUS: If you buy your second tandem skydive the day you do your first one, it’s only $99 (reg. $179)! Go ahead and grab that to save yourself $80; you can do that second tandem anytime–it never expires.